The Alabama Restaurant and Hospitality Association (ARHA) has chapters throughout the state allowing members to share ideas and to participate and focus their energy on local events and issues. Chapters provide members with educational opportunities and local events. 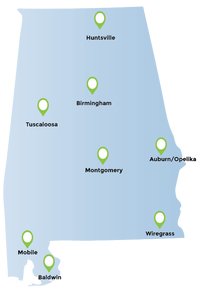 ARHA currently has eight active chapters across the state including Auburn/Opelika, Baldwin County, Birmingham, Dothan, Huntsville, Mobile, Montgomery, and Tuscaloosa. Use the calendar on this page to find a chapter meeting coming up in your area. For more information regarding chapter events, email us or call l 334.244.1320.